In response to Member concerns and identified gaps in rural crime prevention, the CFPA developed a reporting tool we call "Reporter". The initial prototype version of "Reporter" was launched at the CFPA AGM in April 2018. Before we introduced the Reporter, non-emergency incidents could only be reported to authorities via phone or email, and this information was not readily accessible to our Members. A new approach to reporting and documenting incidents was needed. Thus, the Reporter was created. <!-img src="images/app.jpg" width=245 height=289 border=0 align=right Alt="Download our app and report suspicious vehicles or anything that is concerning to you. ">The Reporter is accessible online for Members to report suspicious vehicles, criminal activities, or anything that is concerning to you whenever observed, and allow the sharing of this information with fellow Members. Membership has privileges: All Members of CFPA have exclusive and free access to the Reporter App. This Reporter tool will work with any device that has a relatively modern web browser. This includes most desktop and laptop computers as well as most brands of smart phone, tablet, and other portable devices, and even some TVs and household appliances. If you have a device that runs a relatively modern web browser, you will be able to use the Reporter. All incidents are displayed on a satellite map (via Google Maps), as well as viewable as a list of incidents. Full incident details can be displayed on further navigation. In recognition that crime knows no boundaries, there is no real limitation to where incidents can be reported as occurring. If the location has a GPS co-ordinate, it can be reported and displayed with the Reporter. 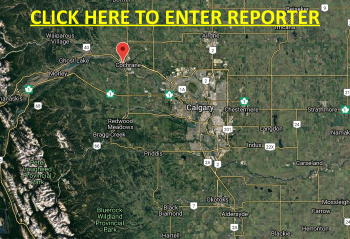 The Reporter does not directly forward incident reports to responders such as RCMP or County services. All crime related incidents should be directly reported to the RCMP before documenting in the Reporter. Use of the Reporter will facilitate sharing of incidents with all our Members - increasing awareness of crime trends in our region. Remember, we are all the "eyes and ears" in our respective communities, and the better we share information about what's happening, the harder it becomes for criminals to take advantage of rural communities.